Contents and Media: 1 part in light gray “Accuranium” (aka: resin). Conclusion: It is about time we had this conversion. First order of business is full and fair disclosure. The last line of the instructions states “Special thanks to Steve Eisenman”. Yes, an explanation is in order. Quite a few years ago I got into a discussion with Chris Bucholtz about the need for a radar nose, colloquially known as a “hose nose”, PBJ-1D conversion for the Accurate Miniatures B-25 C/D. Bottom line, Chris said it might be, could be a possibility. 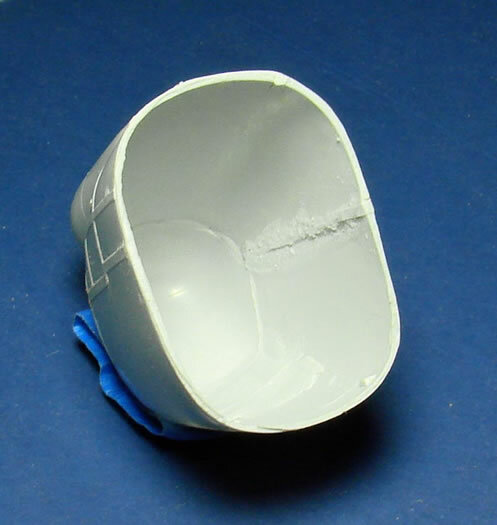 But, somebody had to sacrifice the nose pieces of the A-M kit so a mold could be made. Needless to say, Chris received the parts from my A-M kit within the week. Years later, and sitting with a nose-less A-M B-25, I got the nose to complete my kit. I believe the wait was well worth it. The conversion represents the hose nose configuration used on PBJ-1D’s that had the glass in the nose painted over or had armor placed on the inside of the nose. What was a big surprise to me was how light the box was. I expected a big, heavy hunk of resin. 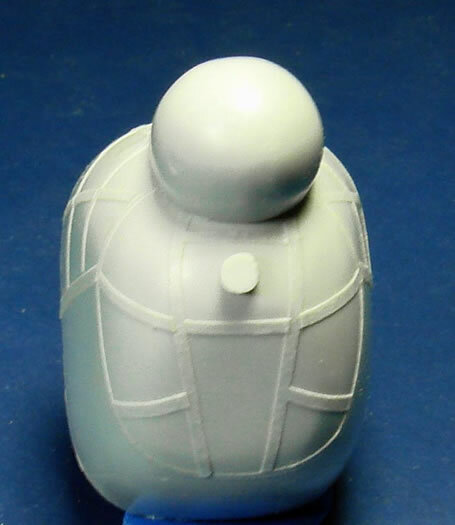 But it seems resin casting has reached new heights, as has been seen in the cowls without a pour block in some of the new Planet model kits. The Obscureco piece is a hollow casting, as can be seen in the picture. This hollow casting has one advantage in that it can be used as a place to put weight. But, care must be taken so as not to distort the thin walls. It must be noted that there was some minimal flash on the ends of the wall at the opening; taken care of with swipes of a sanding stick. Putting weight in the nose raises the issue of how the nose is to be securely attached to the fuselage, since the walls of the molding are quite thin. The answer is Vac-Form building. The best method I can conceive of is to place plastic sheet stock on the inside of the nose of the fuselage so as to make a lip / tab extending out from the opening all the way around. But in order to do that you will need to make some alterations to the fuselage. The mounting tabs for the bulkhead (Part K 21) should be removed. You could either not use the bulkhead, as the nose is not clear, or sand it down and fit it further in the fuselage. After all that is done, simply make final adjustments, with shim if needed, and glue the hose nose to the tabs with cyanoacrylate glue. As to the hose nose itself, I do have some observations. While Obscureco used the A-M nose to get the dimension in order to make it fit the shape of the fuselage as well as it does, they were unable, for molding reasons I presume, to retain the fine lines of the framing. There also seems to be some overlap of the frames. Finally, the angle of the two vertical frames in the very front is slightly more vertical than the frames on the A-M nose. Fatal Flaws? I’ll leave that for you to decide. There is also the issue of the funny little raised knob in the front. I believe this was molded to represent the “plug” placed over the nose gun opening. A few swipes with the sanding stick may be a judicious move to bring this down a smidge. Looking at pictures of PBJ-1s with the hose nose arrangement, there were clearly other variations. One variation was the radar pod mounted on a clear nose PBJ-1D. If one wanted to do this, and detail the interior, and I’m making a big assumption here, one could carefully cut away the pod from the rest of the casting and mount it on the clear part. Another variation was to have armor added to the exterior of the nose, or have it replace the glass. To reproduce this, one could sand down the framing or build up the area between the frames with putty. The question I’m sure many want to know at this point is whether the Obscureco Radar Nose can be used on the Monogram B-25J, as some PBJ-1J models had the hose nose instead of the wing-tip pod. Probably, but not without a bit of work. I taped a Monogram fuselage together and put the Obscureco part up to it. It seems the sides of the Monogram fuselage, at the nose, are more vertical than the A-M fuselage. 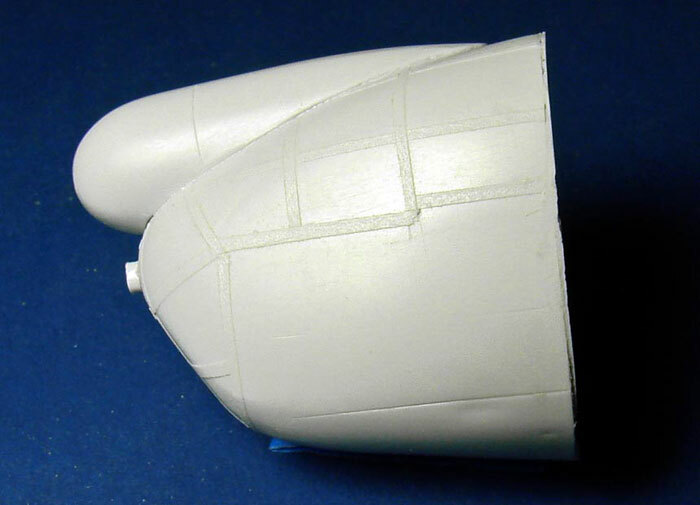 The A-M fuselage has more of a taper, narrowing more at the bottom. One would need to reshape the Monogram fuselage. I bugged Chris for the longest time as to when Obscureco would get this one out. He always said “soon”. Well, the wait was worth it. The Obscureco Radar Nose is a relatively inexpensive conversion allowing modelers to put a B-25D in one of my favorite color schemes, “blue”. Thanks to OSCURECO for the review sample.